This article is about the Classical Syriac language. For contemporary Syriac dialects, see Northeastern Neo-Aramaic. For other uses, see Syriac (disambiguation). This article contains Syriac text, written from right to left in a cursive style with some letters joined. Without proper rendering support, you may see unjoined Syriac letters written left-to-right instead of right-to-left or other symbols instead of Syriac script. Syriac /ˈsɪriæk/ (ܠܫܢܐ ܣܘܪܝܝܐ Leššānā Suryāyā), also known as Syriac Aramaic, is a dialect of Middle Aramaic that was once spoken across much of the Fertile Crescent and Eastern Arabia. Having first appeared as a script in 1st century AD Assyria after being spoken there as an unwritten language for five centuries, Classical Syriac became a major literary language throughout the Middle East from the 4th to the 8th centuries, the classical language of Edessa, preserved in a large body of Syriac literature. Indeed, Syriac literature comprises roughly 90% of the extant Aramaic literature. Old Aramaic was adopted by the Neo-Assyrian Empire (911-605 BC) when the former conquered the various Aramean city-kingdoms to its west. The Achemenid Empire which rose after the fall of the Assyrian Empire also adopted Old Aramaic as the language of the empire and Old Aramaic quickly became the lingua franca of the region. During the course of the third and fourth centuries AD, the inhabitants of the region began to embrace Christianity. The Aramaic language at this point in history is linguistically the Middle Aramaic but since most Christian scribes of the Christian manuscripts, who wrote in the Middle Aramaic, lived in this region of Assyria, which had come to refer to both the historical Assyria as well as the Levant, this specific dialect of the Middle Aramaic has come to be known as Syriac. From the 1st century AD Syriac became the vehicle of Syriac Christianity and culture, and the liturgical language of the Syriac Orthodox Church and subsequently Assyrian Church of the East, together with the later offshoots of the Assyrian Church; the Nestorian Church, Chaldean Catholic Church, Ancient Church of the East, Saint Thomas Christian Churches, and Assyrian Pentecostal Church. 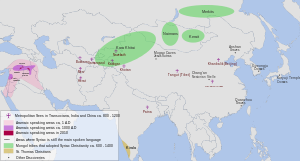 Syriac Christianity and language spread throughout Asia as far as the Indian Malabar Coast and Eastern China, and was the medium of communication and cultural dissemination for the later Arabs and, to a lesser extent, the Parthian Empire and Sassanid Empire Persians. Primarily a Christian medium of expression, Syriac had a fundamental cultural and literary influence on the development of Arabic, which largely replaced it towards the 14th century. Syriac remains the liturgical language of Syriac Christianity to this day. Syriac is a Middle Aramaic language, and, as such, it is a language of the Northwestern branch of the Semitic family. It is written in the Syriac alphabet, a derivation of the Aramaic alphabet. Syriac was originally a 5th-century BC local Assyrian-Akkadian influenced Aramaic dialect of Assyria in northern Mesopotamia that evolved under the influence of Assyrian Church of the East and Syriac Orthodox Church into its current form. Before Arabic became the dominant language, Syriac was a major language among Christian communities in the Middle East, Central Asia and Kerala, and remains so among the Assyrians and Syriac-Arameans to this day. It has been found as far afield as Hadrians Wall in Ancient Britain, with inscriptions written by Assyrian and Aramean soldiers of the Roman Empire. Old Aramaic (the language of Assyria/Athura/Assuristan, and the Neo-Assyrian kingdoms of Assur, Adiabene, Osroene and Hatra). Modern Eastern Syriac Aramaic (Northeastern Neo-Aramaic, including Assyrian Neo-Aramaic and so called Chaldean Neo-Aramaic (the dialects of the Assyrian people) - but the term usually is not used in reference to Neo-Mandaic, another variety of Eastern Aramaic spoken by Mandaeans). The name "Syriac", when used with no qualification, generally refers to one specific dialect of Middle Aramaic, but not to Old Aramaic nor to the various present-day Eastern and Central Neo-Aramaic languages that are descended from it or from close relatives. The modern varieties are, therefore, not discussed in this article. Syriac began as an unwritten spoken dialect of Imperial Aramaic in Assyria-northern Mesopotamia, an Akkadian-influenced version of the Old Aramaic language which was introduced as the lingua franca of the Neo Assyrian Empire by Tiglath-Pileser III (745-727 BC). The first evidence of such dialects that emerge in Assyria, and begin to influence the written Imperial Aramaic from the 5th century BC. After the conquest of Assyria, southern Mesopotamia and Aramea (Syria) by Alexander the Great, Syriac and other Aramaic dialects gradually lost their status as imperial languages but continued to flourish as lingua francas alongside Ancient Greek. In 132 BC, the Neo-Assyrian kingdom of Osroene was founded in Edessa with Syriac as its official language. 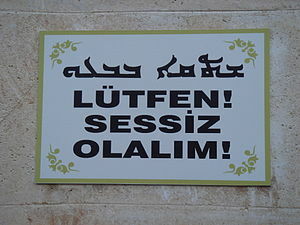 Many Syriac-speakers still look to Edessa as the cradle of their language. 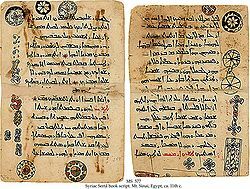 There are about eighty extant early Syriac inscriptions, dated to the first three centuries AD (the earliest example of Syriac, rather than Imperial Aramaic, is in an inscription dated to AD 6, and the earliest parchment is a deed of sale dated to AD 243). All of these early examples of the language are non-Christian. As an official language, Syriac was given a relatively coherent form, style and grammar that is lacking in other Old Eastern Aramaic dialects. In 489, many Syriac-speaking Christians living in the eastern reaches of the Roman Empire fled to the Sassanid Empire to escape persecution and growing animosity with Greek-speaking Christians. The Christological differences with the Assyrian Church of the East led to the bitter Nestorian schism in the Syriac-speaking world. As a result, Syriac developed distinctive western and eastern varieties. Although remaining a single language with a high level of comprehension between the varieties, the two employ distinctive variations in pronunciation and writing system, and, to a lesser degree, in vocabulary. Western Syriac is the official language of the West Syrian rite, practised by the Syriac Orthodox Church, the Syrian Catholic Church, the Maronite Church, the Malankara Orthodox Syrian Church, the Malabar Independent Syrian Church, the Mar Thoma Church and the Syro-Malankara Catholic Church. Eastern Syriac is the liturgical language of the East Syrian rite, practised in modern times by the ethnic Assyrian followers of the Assyrian Church of the East, the Assyrian Pentecostal Church, the Ancient Church of the East, the Assyrian-Chaldean Catholic Church, as well as the Syro-Malabar Church in India. From the 7th century onwards, Syriac gradually gave way to Arabic as the spoken language of much of the region, excepting northern Iraq. The Mongol invasions of the 13th century, and the religiously motivated massacres of Assyrian Christians by Tamurlane further contributed to the rapid decline of the language. In many places outside of northern Mesopotamia (the Assyrian homeland), even in liturgy, it was replaced by Arabic. A warning sign: Please! Let's be quiet! ', in Syriac and Turkish languages. Revivals of literal Syriac in recent times have led to some success with the creation of newspapers in written Syriac (ܟܬܒܢܝܐ Kṯāḇānāyā), similar to the Arabic Fuṣḥā has been used since the early decades of the 20th century. Modern literary Syriac has also been used not only in religious literature but also in secular genres often with nationalistic themes. Syriac has been recognised as an official minority language in Iraq. It is also taught in some public schools in Iraq, Israel, Sweden and Kerala/India. In 2014, an Assyrian nursery school could finally be opened in Yeşilköy/Istanbul after waging a lawsuit against the Ministry of National Education which had denied a permission, but was required to respect non-Muslim minority rights as specified in the Treaty of Lausanne. Among the Syriac churches of Kerala, Malayalam often replaces Syriac. Literary Syriac is often used as a spoken language by clerics who do not speak the vernacular dialects. ܢܫܩܘܠ – nešqōl: "he will take"
ܫܩܠܘܬܐ – šaqlūṯā: "a beast of burden"
The absolute state is the basic form of the noun – ܫܩ̈ܠܝܢ, šeqlīn, "taxes". In Old and early Classical Syriac, most genitive noun relationships are built using the construct state, but contrary to the genitive case, it is the head-noun which is marked by the construct state. Thus, ܫܩ̈ܠܝ ܡܠܟܘܬܐ, šeqlay malkūṯā, means "the taxes of the kingdom". Quickly, the construct relationship was abandoned and replaced by the use of the relative particle ܕ, d-, da-. Thus, the same noun phrase becomes ܫܩ̈ܠܐ ܕܡܠܟܘܬܐ, šeqlē d-malkūṯā, where both nouns are in the emphatic state. Very closely related nouns can be drawn into a closer grammatical relationship by the addition of a pronominal suffix. Thus, the phrase can be written as ܫܩ̈ܠܝܗ ܕܡܠܟܘܬܐ, šeqlêh d-malkūṯā. In this case, both nouns continue to be in the emphatic state, but the first has the suffix that makes it literally read "her taxes" ("kingdom" is feminine), and thus is "her taxes, [those] of the kingdom". Adjectives always agree in gender and number with the nouns they modify. Adjectives are in the absolute state if they are predicative, but agree with the state of their noun if attributive. Thus, ܒܝܫܝ̈ܢ ܫܩ̈ܠܐ, bīšīn šeqlē, means "the taxes are evil", whereas ܫܩ̈ܠܐ ܒܝ̈ܫܐ, šeqlē ḇīšē, means "evil taxes". Syriac also employs verb conjugations such as are present in other Semitic languages. These are regular modifications of the verb's root to express other changes in meaning. The first conjugation is the ground state, or Pəʿal (this name models the shape of the root). form of the verb, which carries the usual meaning of the word. The next is the intensive state, or Paʿʿel, form of the verb, which usually carries an intensified meaning. The third is the extensive state, or ʾAp̄ʿel, form of the verb, which is often causative in meaning. Each of these conjugations has its parallel passive conjugation: the ʾEṯpəʿel, ʾEṯpaʿʿal and ʾEttap̄ʿal respectively. To these six cardinal conjugations are added a few irregular forms, like the Šap̄ʿel and ʾEštap̄ʿal, which generally have an extensive meaning. ↑ 1.0 1.1 "Dialect, Culture, and Society in Eastern Arabia: Glossary". Clive Holes. 2001. pp. XXIV–XXVI. ↑ 2.0 2.1 "The Mediterranean World in Late Antiquity". Averil Cameron. 1993. p. 185. ↑ "Tradition and Modernity in Arabic Language And Literature". J R Smart, J. R. Smart. 2013. ↑ Kiraz, George. "Kthobonoyo Syriac: Some Observations and Remarks". HUGOYE: JOURNAL OF SYRIAC STUDIES. Beth Mardutho: The Syriac Institute and Institute of Christian Oriental Research at The Catholic University of America. Retrieved 30 September 2011. ↑ "Syriac...a language struggling to survive". Voices of Iraq. 28 December 2007. Retrieved 30 September 2011.